This property is located in front of a newly opened Publix Supermarket at the NEC of Park Blvd and 47th St N in Pinellas Park, Fl. IHOP is being developed right next door in the same development. This site is amid a very tight commercial retail corridor that presents high barriers to entry. 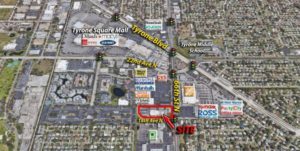 This property is located at the prime traffic‐lit intersection of Park Blvd and 49th St N in Pinellas Park, Fl. This high traffic corner is amid a very tight commercial retail corridor that presents high barriers to entry. The site features excellent access from all directions. This property is the southeast corner of the intersection of 22nd Ave N and 31st St N in St. Petersburg, Fl. The site features 540 feet of frontage on 22nd Ave and access points on 22nd Ave and 31st St. A newly constructed Advance Auto Parts is on the west side of the property, and a new carwash on the east side. Dunkin Donuts, Little Caesar’s, and a Nail Salon are in the middle. 1,335 square feet of retail space is available adjacent to Dunkin Donuts. Located at the NWC of the traffic-lit intersection of 4th St N and 30th Ave N in St. Petersburg, FL. The site sits across from a new Fresh Market, and features excellent access and great visibility from all directions. Located at ground zero for St. Petersburg Retail, 4th St N and 38th Ave is the place everyone wants to be in St. Pete. This former Arby’s restaurant location is one block north of this prime retail hub. With full access and great visibility, this site is perfectly suited for nearly any retail use. The site can be expanded to 1.3 acres in total size. Please contact us for more details. Located at the hub of St. Petersburg Retail, 4th St N is the place to be in St. Pete. This former Pizza Hut restaurant location is right in the mix of this retail hub. With full access and great visibility, this site is perfectly suited for nearly any use. This property is located in an a very tight market with high barriers to entry. Located at the entrance to Largo Mall, this property has three usable 2-story buildings or the 3.1 acres can be redeveloped. This property is located in an a very tight market with high barriers to entry. Right at the traffic light and conveniently situated in front of Publix, this former bank branch features excellent visibility and sits at the prime location at the corner. Cross parking and offsite retention are in place already.